This is a wonderful idea. 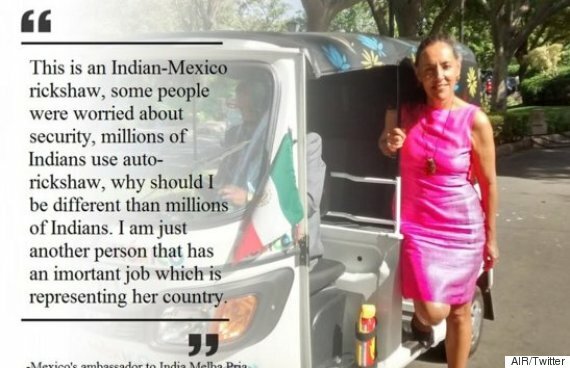 I hope this woman’s example will be followed by other ambassadors in Delhi and the Indian elite. It would help with the fumes and are very efficient slipping in and out of traffic. The traffic in Delhi, a city of 28,000,000 souls defies description! It just stops for long periods of time. This entry was posted in Delhi, India, Travel, Uncategorized and tagged Auto-rickshaw, Delhi, India, Mexican ambassador in India, Mexico, traffic. Bookmark the permalink. Thanks for detail information. Your article is much informative. I have created a portal which is dedicated to advertising industry. SmartAds.in is a Portal for Media Buying and Advertising need. Its aim is to bridge a gap between Media Owners and Advertisers. In this we have covered 3 Lakhs+ Advertising Options which includes both Offline and Online Media.